Our commitment to our patients is to provide the most advanced level of care possible. One of the dentists on the Kumeu Dental team is a senior registrar in oral and maxillofacial surgery, with a degree in both medicine and dentistry. Because of this, Kumeu Dental is able to provide a variety of advanced oral surgery and implant procedures to our patients at our home office. We are also able to provide intravenous sedation to ensure patient comfort during treatment. The third set of molars are typically called wisdom teeth and usually erupt between the ages of 17 to 25. While there are normally four wisdom teeth (one in each quadrant of the mouth), it isn’t uncommon for some people to have more or less. Infection: pain and swelling often accompany impacted wisdom teeth. Antibiotics may be necessary to help eliminate initial infections prior to surgical removal of the tooth. Infected wisdom teeth often cause discomfort and extended recovery time. Decay and damage to adjacent teeth: because wisdom teeth are often difficult or impossible to keep clean, they have an increased rate of decay. The tooth decay can also spread to adjacent teeth, so removal of the wisdom teeth is proactive in preventing advancement of disease. Bone loss and gum disease: the inability to floss around partially erupted or impacted wisdom teeth allows bacteria to enter under the gumlines and cause gum disease. 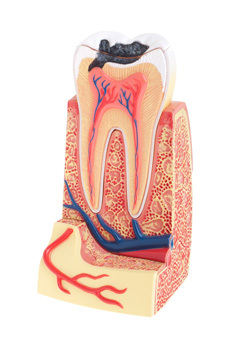 Gum disease, including bone loss, affects adjacent teeth and causes a chain reaction throughout the mouth. Crowding from the pressure of impacted wisdom teeth can also cause tooth misalignment in the rest of the mouth. On rare occasions, cysts may occur around developing wisdom teeth. These cysts can cause irreversible damage to the jaw bone. It may be necessary to remove wisdom teeth if they are impacted, or depending on their location in relation to other teeth. Many wisdom teeth are difficult to keep clean and are of very little use due to their location. The best time to have wisdom teeth removed is during your late teens or early 20′s, due to the elasticity and growth of the jaw, which promotes quicker healing time. Modern dental implantology has become the most efficient and effective way to replace missing teeth. Even the loss of one tooth can dramatically impact the health and position of all other teeth in the mouth. Missing teeth affect both aesthetics and function, and can lower a person’s self-esteem and quality of life. As other teeth become misaligned, premature wear and gum disease become evident. The structure of a dental implant involves a titanium root replacement that is secured into the jawbone and hidden from view. Implant roots are made of titanium because it is biocompatible and promotes bone growth around the appliance for additional stability. 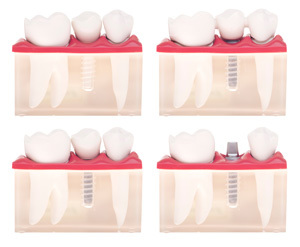 On these implants any number of tooth replacement options can be affixed, including crowns, bridges, and even dentures. 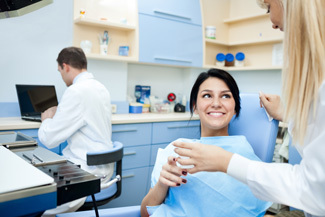 Intravenous (IV) sedation services are available for all oral surgery procedures. This ensures patient comfort and reduces the length of the necessary treatment time. IV sedation is the deepest level of sedation that we can offer our patients, and the patient is completely unaware of the procedure once the medication has taken effect. Recovery from IV sedation is rapid, and the patient begins to wake up just minutes after the medication is cut off following the procedure. Patients with severe dental anxiety may also choose to receive IV sedation in order to be comfortable while receiving necessary care. Oral sedation using prescription medication prior to the appointment is also effective and causes the patient to feel sleepy or only half-awake during their therapy. Patients are typically unaware of their procedure and have no memory of it once their medication has worn off. Oral sedation does not have a rapid onset or recovery time the way our IV sedation services do. Important to note: all IV and oral sedation patients should also plan to be accompanied by a family member or friend on their way to and from our office.